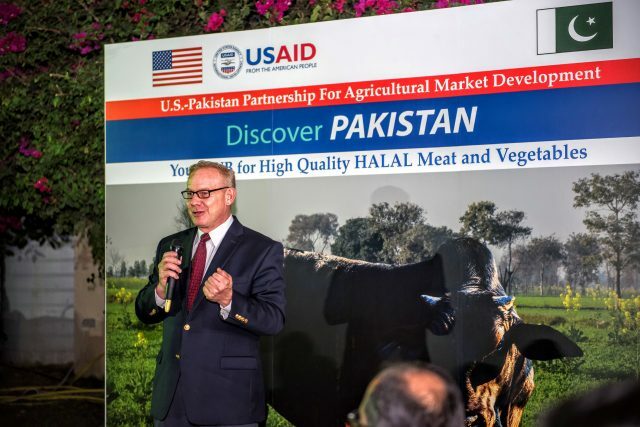 The U.S.-Pakistan Partnership for Agricultural Market Development (AMD) activity in Pakistan is a USAID-funded program, started in February 2015 and projected to end in February 2019, and implemented by CNFA with the goal of supporting the development of Pakistan’s commercial agriculture. In particular, we accomplish this through improving the ability of Pakistan’s agriculture and livestock sectors to meet both international and domestic demand and requirements in targeted product lines in citrus, mango, high value/off season vegetables and livestock. AMD aims to transform the four targeted product lines into efficient, private sector-led value chains that deliver competitive products to domestic and export markets. AMD’s targeted training, matching grants, and technical assistance will leverage private sector investment and encourage innovation. This broad-based approach will upgrade and streamline supply chains, optimize profit margins, increase participation of women entrepreneurs, and ultimately make Pakistani mango, citrus, meat and HV/OSV more profitable and more competitive. Objective: Increase the efficiency, quality and profitability of select product lines, through the adoption of production, marketing, and business organization management practices that will transform supply chains of select specific product lines to higher levels of production. AMD will facilitate increased demand for Pakistani agricultural products and foster supply-demand synergies between producers and buyers. Objective: Improve market linkages within targeted product line chains and develop the institutional capacity of catalytic actors within chains. AMD will work with processors, traders, retailers, and ancillary service providers that support the targeted value chains. AMD will develop Pakistan’s commercial agriculture by improving the ability of Pakistan’s agriculture and livestock sectors to meet both international and domestic demand in targeted product lines.